(Newser) – Lance Armstrong's former teammates are planning to testify against the champion cyclist amid doping charges, insiders tell the New York Times. George Hincapie, Levi Leipheimer, Christian Vande Velde, and David Zabriskie have all said they'd testify on behalf of the US Anti-Doping Agency. "I’m sad he is going through this," says Hincapie, who rode alongside Armstrong each time he won the Tour de France. "He’s done so many things for the sport." Hincapie wouldn't comment on whether he plans to testify, but added, "I feel like I’ve always done the right thing for the sport." 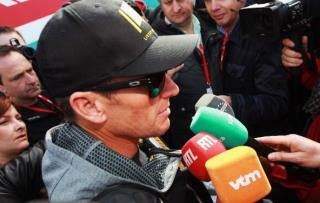 Cyclists Floyd Landis and Tyler Hamilton, both tied to doping, will also help the agency make its case. Everybody has something to hide except for me and my monkey. when last this was in the news, they were talking about having test results from, I think it was ... 2009 and 2010 ... goin' on three or four years ago ... Now ... where were all these people? Why is it three years later and NOW they're pursuing the matter? Why, after five HUNDRED negative tests, do we see TEAM MATES, after this long, coming forward NOW? You guys all have the olfactory presence of a week-old mackerel.